Sitting Bull was born in 1831, in the area we now call South Dakota. He was Teton Sioux, and his band was called Hunkpapas. Sitting Bull was very young when he joined the elite warrior society called Strong Hearts. Shortly afterward, Sitting Bull was shot in the left foot by a Crow chief. Without hesitation he took revenge by stabbing the chief through the heart. However, he would limp the rest of his life. 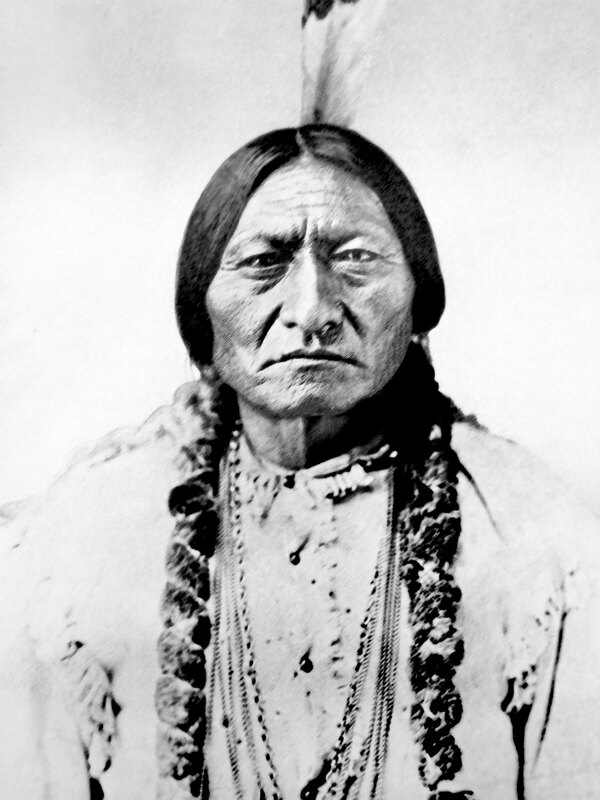 Before long, Sitting Bull claimed he had killed over 60 men in battle. In 1860, the United States Army started construction on Fort Buford at the confluence of the Yellowstone and Missouri Rivers. Sitting Bull response was immediate. He and the Strong Hearts launched a series of strikes against the fort and the surrounding area. The military tried to get them to sign a peace treaty but they refused. At the same time, gold was discovered in the Black Hills. The Sioux called the Black Hills “Paha Sapa” or the center of the world. All whites were forbidden. However, hundreds of them were pouring in. In November of 1875, the Commissioner of Indian Affairs told Sitting Bull to report to the Great Sioux Reservation. Sitting Bull refused and instead he asked the Sioux and Cheyenne for help. A few months later, 15,000 Indians gathered on the banks of the Rosebud Creek. It didn't take long before Sioux scouts spotted General George Crook and his men advancing on their encampment. Both sides would battle until they had suffered major casualties. After the battle, on Rosebud Creek, the Sioux and the Cheyenne relocated their encampment along the west bank of the Little Big Horn River. Then on June 25, 1876, they would be attacked by Lieutenant Colonel George Armstrong Custer and the Seventh Cavalry. Custer, who was eager to make a name for himself, decided not to wait for reinforcements. Unfortunately, he dramatically underestimated the opposing forces. More than 1,000 warriors swarmed down on Custer and his men, and this time they were well armed. Sitting Bull sat on a nearby hilltop armed with a Winchester carbine, and a 45 handgun watching the entire slaughter. Custer and 220 of his men perished in what was the worse defeat ever suffered by the United States military at the hands of the Indians. Sitting Bull and his men escaped across the border into Canada where they would stay for four years. At this time, Sitting Bull's band contained only 190 or so people. Half-starved, they eventually surrendered at Fort Buford. Sitting Bull was then held as a prisoner of war at Fort Randall for 2 years. In 1890, a new religious movement spread throughout the Native American world. Whites called it the Ghost Dance, and the Ghost Dance religion promised that they would return to the world that existed before the whites. Eight thousand army reinforcements were sent in to stop the movement and arrest Sitting Bull. However, when they tried to clear a path to arrest him shots rang out and he died, his son died, eight of his followers were killed, and six policemen. Two weeks later on December 28, 1890, Custer's old regiment the Seventh Cavalry caught up with the Sioux who were now being led by Chief Big Foot. The battle that ensued left over 200 Sioux men, women, and children dead. In addition, 64 soldiers died. This slaughter, which is called the Wounded Knee Massacre is known as the end of the American Indian Wars.